Штурмовик A-4E из эскадрильи VA-23 запускает 70-мм НАР. 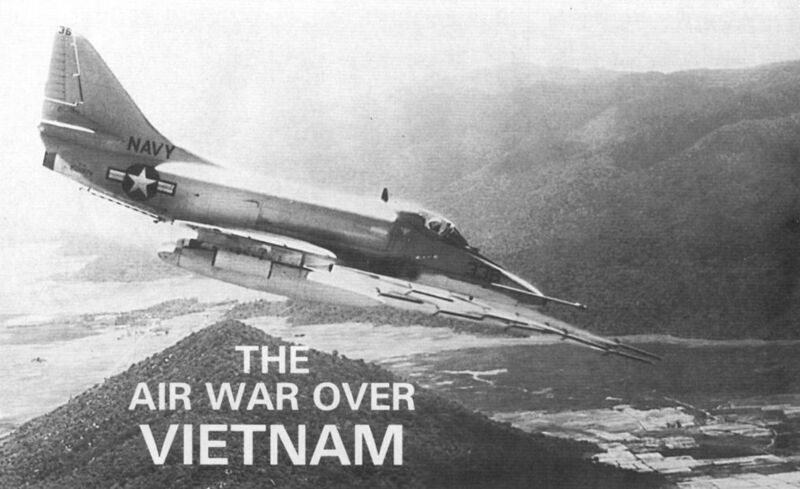 An A-4E from Navy Attack Squadron VA-23 unleashes a volley of 3in rockets at a Viet Cong position. A total of 499 A-4Es was built to replace A-4Bs and A-4Cs. An F-8C (F-8D ???) of VF-111 from the carrier USS Midway fires a Zuni rocket during a ground support mission in South Vietnam. A radar-equipped Grumman E-2 Hawkeye landing on the USS Kittyhawk. Deliveries of the Hawkeye to US Navy units began in January 1964. ВВС США в качестве самолета РЭБ в основном применяли Douglas EB-66, но иногда он вел на цель группы бомбардировщиков, поскольку его превосходное навигационное оборудование позволяло осуществлять бомбометание сквозь плотную облачность. "Bombs away!.." Звено истребителей-бомбардировщиков F-105D наносит удар из-за облаков по команде экипажа "следопыта" EB-66. 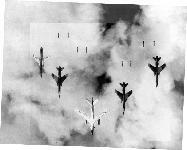 Four Republic F-105 Thunderchiefs releasing their bombs under the radar control of a Douglas B-66 Destroyer. An ECM-equipped EA-1F Skyraider from VAW-13 about to be launched from the USS Oriskany. 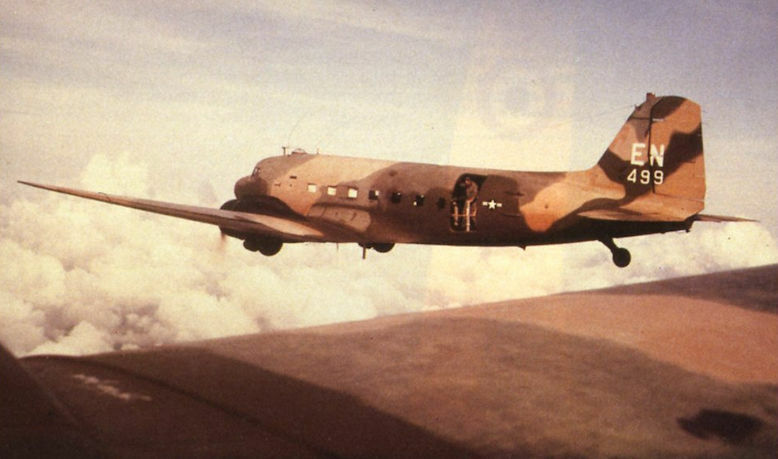 A Douglas AC-47 gunship. The first of these, belonging to the 4th Air Commando Squadron, arrived at Tan Son Nhut in November 1965. Note the crewman holding a flare in the door­way. 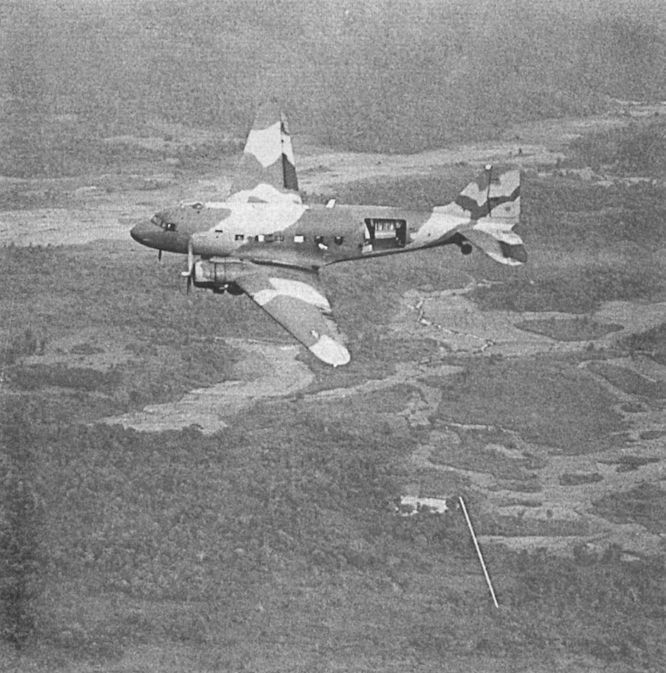 An AC-47 Dakota gunship engages a target on the ground. The white streak is the tracer bullets just fired from the guns.